The proposals include over 850,000sq ft of employment space which may provide for up to 1,200 jobs in a number of new buildings. Reflecting the variety of demand for commercial and employment space, the buildings would range from 10,000sq ft to over 250,000sq ft and include warehouse, light industrial and general industry space. 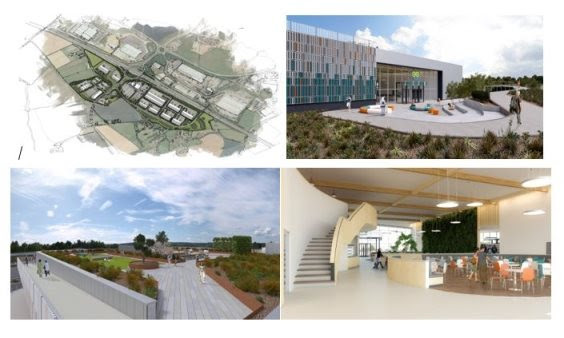 Submitted by property consultants JLL on behalf of the land owner S Notaro Land and the new motorway services operator, Euro Garages, the plans have been prepared by a consultant team including Peter Brett Associates (part of Stantec), LHC Design and ADS Architects. The employment park will be marketed by property consultants JLL. Giles Weir, JLL Director added “Notaro Park will meet the very great need we are seeing at the moment for good quality space in an excellent location right on the important M5 corridor. The industrial and logistics sector remains a strong performer in the market so sites such as this on busy motorway junctions are vital for growth and meeting occupiers’ requirements”. The Motorway Service Area will form the first phase of development and provide the principal site infrastructure to enable Notaro Park to develop soon after. Phil Bartleet of Euro Garages commented: “We are very excited by the opportunity that this new service area presents. As a company we are expanding into this market and the Junction 24 location will be a real flagship for us, helping us to bring something new to the market for the users of the M5 in the South West”.